A-HOTEL.com - Luxury and cheap accommodation in Chentsy, Russia. Prices and hotel, apartment booking in Chentsy and surrounding. Base Hunting and Recreation Kabanchiki is situated in Goloperovo. Free WiFi is featured. 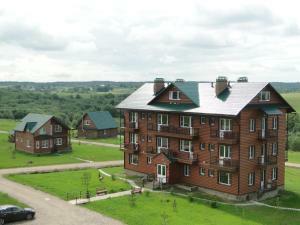 Holiday Home u Lyzhnika is situated in Pereslavl-Zalesskiy and has ski-to-door access, barbecue facilities and a garden. Among the various facilities are a terrace and ski storage space. Set in Pereslavl-Zalesskiy, Winter Country House and SPA offers a seasonal outdoor swimming pool, a garden and a barbecue. Boasting a terrace, the country house is in an area where guests can engage in activities such as skiing, cycling and fishing. Just a 5-minute drive from Lake Pleshcheeva, this quietly located hotel offers fine Russian and European cuisine, and horse riding facilities. Pereslavl-Zalessky Central Bus Station is 15 km away. Located in Pereslavl-Zalesskiy, Guesthouse na Yamskoy provides accommodation with free WiFi and barbecue facilities. Each unit is fully fitted with a washing machine, a flat-screen TV, a sofa and wardrobe.